It is less expensiveMulti-year donors refer other donors and yield larger gifts and legacy gifts. Donor retention is a hot topic in the nonprofit arena and Jay shares that nonprofit donor retention lags far behind for profit customer retention. He discusses the importance of measuring donor retention and shares steps to improve donor retention. Jay has served the nonprofit sector for 32 years and is considered the most well-known senior statesman whose advice is sought constantly. 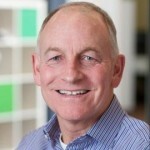 Prior to Bloomerang, he was the CEO and Co-Founder of eTapestry, which at the time was the leading SaaS technology company serving the charity sector. Prior to starting eTapestry, Jay served as President and CEO of Master Software Corporation. MSC provided a widely used family of database products for the non-profit sector called Fund-Master. He is a graduate of Butler University with a B.S. in Business Administration. Over the years, he has given more than 2,500 speeches around the world for the charity sector and is often the voice of new technology for fundraisers. Jay is chairman of the AFP Ethics Committee and has served on many nonprofit boards. He and his wife Christie served as co-chairs for the Indianapolis YMCA 2011 Capital Campaign and are the proud parents of three children as well as five grandchildren. Follow Jay on Twitter at @JayBarclayLove.